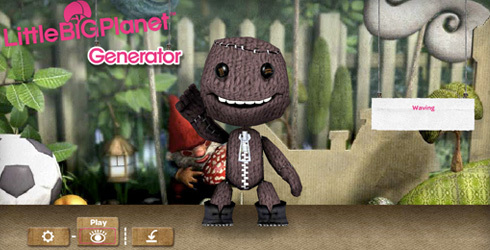 LittleBigPlanet Generator was a Flash game released in September of 2008 to promote the PlayStation 3 title LittleBigPlanet. In the game, one could customize their own 3D Sackboy and share it for others to view. The game was originally hosted on Mysackboy.com, but appears to have been taken down sometime in 2011, with the URL redirecting to the official Playstation homepage at one point and now simply not working at all. None of its files have been resurfaced, and even using the Internet Archive's Wayback Machine will only yield a black screen. As of now, only one video and a couple screenshots of it can be found.